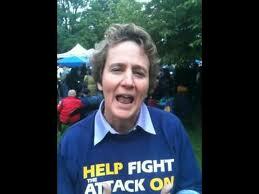 SEIU President Mary Kay Henry clearly believes that luck only comes through union membership, and she has that right . . . if you happen to be running a labor union or are among their executive committee cronies. In a piece written yesterday entitled “At Stake This Labor Day,” Henry regurgitates the same old, feeble, leftist pap. Castigating Republicans for everything from a war on the middle class to the nation’s long faltering educational system (hello, NEA, is anybody home?) to a “crusade to scapegoat immigrants,” Henry proclaims that Republicans don’t even understand the meaning of Labor Day. Henry, taken into custody during the “Occupy” Movement with other SEIU members while chanting “We are the 99%,” is still smarting from the historic Wisconsin collective bargaining defeat and the millions spent by unions in their attempt to recall Gov. Scott Walker. No explanation from Henry on her $300,000 – $350,000 salary (not including benefits and perks) as to how she falls into the 99% camp. Also absent in Henry’s ramblings is the fact that some school districts in Wisconsin have gone from $400,000 deficits to a $1.5 million surplus, or that by simply freeing the state from the Wisconsin Teacher’s Association’s chokehold on insurance carriers, 52 Wisconsin school districts have already saved roughly $30 million. No mention in Henry’s piece of the inspired wave of job creation by other reform-minded governors like Mitch Daniels in Indiana, Sam Brownback in Kansas, Chris Christie in New Jersey, Bill Haslam in Tennessee and Mary Fallin in Oklahoma, to name a few, all of whom have pushed for common sense policies that have put these states on firmer financial footing, with some of the lowest unemployment in the nation. Of course, Henry has her supporters in other union bosses, if not the rank-and-file who are forced to contribute to union coffers, but she lost a big one in former pro-labor Democrat Gloria Romero, who served as California’s Senate majority leader from 2001 to 2008. Ms. Romero now heads the California chapter of Democrats for Education Reform, a large tent of reformers united by a desire to improve accountability in public schools. “The California Teachers Association walk around like they are God,” Romero says, “killing or hijacking nearly every reform bill that has popped up in the legislature,” even torpedoing bills to let high school teachers volunteer to be evaluated for competency and a bill that would have made it easier to fire teachers who molest students. Unions spent $90 million to defeat reform efforts in California in 1998 and 2005, and they have already put up $24 million to sink this year’s initiative to enact modest payroll-deduction measures that would save the state millions. “If you keep putting more money into the same system, we’re going to keep getting the same result. And that’s the definition of insanity,” Romero laments – all of this from a California Democrat. Don’t hold your breath for Romero’s speech this week at the DNC.